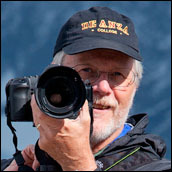 This month, our featured guest is professional photographer, Dan Mitchell. Thank you to Dan for generously sharing his time, experience and work with us! We appreciate having him as our guest photographer of the month! Please visit his site links to see more of his wonderful images. :: Your father helped influence your start in photography. What was it about the medium that really pushed you in? My father was an interesting guy, a college professor and talented amateur photographer who also apparently liked to collect a variety of cameras and related gear, and who would set up a temporary darkroom in a bathroom to develop film and make prints. When we were quite young, each of the four kids acquired box cameras and learned to make photographs. At that age just having a camera was quite a privilege! I think that at first I was just intrigued by the equipment, as basic as it was. The experience of watching my dad develop prints, and eventually getting to help was magical. And before long I started looking at his photography books and, though I didn't understand it at the time, began to develop a visual sensibility based on the photographs I saw there. It was only a few years ago that I started to understand what I had been doing without knowing it as early as my junior high school years, namely trying to make photographs that captured that "something" that I apparently had seen in some of these books -- making photographs of Yosemite, of weathered fences, and of oak trees in fields and meadows. 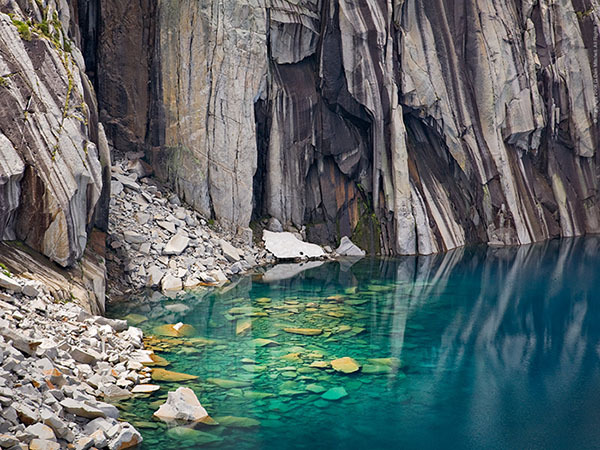 By the time I was in high school I began to connect my photography more directly to my outdoor interests, which eventually included backpacking, rock-climbing, and cross-country skiing. In college and thereafter I began to head into the back-country with one or more cameras, and on occasion the photography became almost the most important focus of these trips. As many photographers will tell you, carrying and using the camera focuses the visual awareness in powerful ways, and I think that carrying the camera into the wilderness had this effect on me. :: A large majority of your work is outdoor related. Given your experience and background, how often do you photograph other subjects (such as urban, night, etc.)? It might surprise those who have seen my landscape and nature photography that I photograph these other subjects a lot! I have done a lot of night photography, mostly in urban and industrial settings. I'm very enthusiastic about what I alternately refer to as "street photography" or "urban landscape" photography, and I shoot frequently in San Francisco and have had the opportunity to shoot in several other urban areas. While I love shooting the natural landscape, which is probably the major part of my work, I'm not one of those folks who is only interested in that subject. I am interested in photographing almost anything, and I feel that almost any subject can provide photographic opportunities. I will start a project next year that will have me photographing musicians over the three-year period. I feel that photographing a variety of subjects makes me a better photographer and encourages me to see the world in new and different ways. :: Any desire to do portrait work, or weddings? Yes and no. I love great portrait work, and I've seconded other photographers at a couple of weddings. I thought it was challenging and fun -- but I don't have any plans to pursue that sort of thing. However, as I mentioned above, I am very excited about my upcoming project photographing musicians and the world in which they work, and I suppose that comes close to environmental portraiture. I also have a sort of an ongoing informal project to photograph other photographers. :: You've had a blog that's run for quite a while. How did you get started in blogging, and can you talk a bit on how it's helped you creatively, and why you continue to be one of the few who post quite regularly. There is a lot I could say about this! But I'll try to keep it (sort of) short. I started blogging back in the 1990s before the term "web log" (later shortened to "blog") was coined. I had started running a web server in conjunction with my college teaching work a year earlier and was figuring out that the web could be a way to communicate and build community. At this point, nearly twenty years later, blogging is almost second-nature to me. Perhaps because of my background in music, regular practice is central to what I do. And for the past four years or more, part of this "practice" ritual has involved creating photographs at a rate that has allowed me to post a new photograph with some commentary every day. While I have no illusions that I can produce 365 great photographs every year, the constant purposeful work makes me a better photographer. I know that some think you should only show those few photographs that constitute your best work, but I'm not so sure. So, the blogging helps me in a number of ways. Creatively, the self-imposed assignment of continuously creating new work keeps me focused and also encourages me to try new things. Writing about my photographs helps me to think more about the context of the work. And the sharing, both via my blog and on social media sites, has connected me to a world of wonderful photography and photographers. :: Does the blog ever feel like more of a chore than a joy? How do you find time to do the writing and yet, still have time to be involved in so many discussions on other forums and blogs? I'll start with another "yes and no" answer. Fortunately, writing usually comes fairly easily for me. But at times the task of getting another photograph on the blog can be a bit daunting. When things are going well I may have as much as a month of work already in the pipeline and queued up for publication. (As I write this, the next two weeks of images and commentary are already in the queue. Yes!) On the other hand, there have been a couple of occasions when I actually did not know what I would post the next day! I got up in the morning, went out to make a photograph, came home, processed and posted. Starting a thing like a daily blog can be the most intimidating part for many people. Oddly, it often seems to scare the best writers more than it scares weak writers, perhaps because blog writing works quite differently than the writing that many of us were trained to do. My academic background prepared me to carefully research a subject, outline and plan my writing, and then refine it through a long editing process... before the writing ever saw the light of day. But on the web, that may not be the most effective approach, and I have seen good writers with much to say paralyzed by the daunting idea that they might have to go through that sequence daily. But writing for the web is very different. You do need to be self-critical and careful about what you write, but sometimes it is more valuable to write something fairly well and get it out there than to wait until it is utterly perfect. On the web, writing is more conversational, and you can return and re-edit or comment on your earlier work. In the end, the individual post is often less important than the flow of the body of work. :: How do you think social media has changed photography? Is it for the better or worse? Where do you see it all heading? Well, there sure is more of it! Despite the fact that not everything on the web is always great writing or great photography, the sheer quantity of work has exposed far more people to far more work and far more ideas more quickly than in the past. I think it is also important to keep in mind that this new means of communication is still very much in its infancy. The rate of change and evolution remains very rapid. Last year's cool new thing is this year's "Oh, yeah, I do remember when we did that." For all of our constant engagement in these new media, we probably know far less about where it is all heading than we think. There are some negatives that we must watch out for. For example, certain kinds of photography that evoke an immediate response on the screen may not have what it takes to sustain long-term interest. Conversely, there is a lot of really great and beautiful photography that does not show well on computers. I think we are all aware of examples of styles that are instantly striking and attention-grabbing, but which soon become cloying and even unoriginal. Think of some of the over-the-top HDR stuff, for example, or some of the "me too" black and white street photography, or any of a number of other examples. The fact that much online interaction -- with media and with people -- can have a shallow and superficial character is also a bit concerning. There is no denying that being able to converse with perhaps hundreds of people all around the planet on some interesting topic is compelling, but, sometimes we run the risk of substituting quantity for quality. Another double-edged sword in all of this is the anonymity that the net provides. This has its value, but it also encourages people to spew things that they would never say in a direct conversation with a real person. But I don't want to focus on the negative! Social media has put me in touch with certain photographers and others whose work I have known about for many years, but who I had never met and probably would not have met had I not encountered them online. Casual mentions of a photographer, an event, a show, or an article have sent me off to look further and I've found compelling and powerful stuff as a result. And there is a group of photographers and other folks with whom I have established wonderful relationships online, some of which have played out in the physical world. :: What is your favorite piece of non-photographic equipment that you can't live without while in the field? Wow. That is a tough question. It probably depends on what "field" we are thinking of. Sometimes I head out for a day of shooting, driving to one of the many wonderful locations within a few hours of my San Francisco Bay Area home. On those trips, I'm tempted to name "the closest Starbucks" as the equipment I cannot live without! On longer trips I often camp, partly to reduce costs but even more to maintain my flexibility to be where I need to be when I need to be there. As you know, photographers don't live on the same schedule as the normal world! We're up well before the first light, may finish shooting after everyone else has finished breakfast, hang out during the "blah light" midday hours (at least sometimes), and then head back out before dinner, working until the light is gone. When I camp I can just live that schedule without trying to fit my work into the normal daytime rituals of the rest of the world. So let me go out on a limb and just identify that collection of stuff that lets me work this way as the non-photographic gear without which I can't live. Yes, that is a bit vague - since it includes everything from the back of my Subaru Outback (where I may spend the night, ready for early shooting) to my tent (the big car camping one or the bivy sack I may use on back-country shoots) and more. :: California is your primary focus with your photography. Do you ever feel like you need to get out somewhere else? Is there anywhere you're itching to go? How do you keep it all fresh having been to some of these places you've photographed so many times? Funny you should mention that, considering that I just had a wonderful experience in April shooting out of state in a location that I now wish I had visited years ago! Do I feel like I need to get out and shoot elsewhere? In many ways, no. I live less than a half hour from beautiful examples of the California grasslands and oak forests - a wonderful subject that often is overlooked. I can be at the Pacific coastline in under an hour. I can be shooting among coast redwoods in an hour. An hour ride on a train gets me to street shooting in San Francisco. In two hours I can be photographing the monumental flocks of migratory birds in the Central Valley. Yosemite Valley and the Sierra Nevada are barely four hours away, and the east slopes of the range are only an hour or two further. I can leave home in the early morning and have a camp set up in Death Valley by mid-afternoon. With all of these opportunities and more, I rarely feel like I can't find the subjects I need within the state. Yet... I do travel. I've spent a total of a month in Alaska - though not doing photography. I get to New York City regularly, along with some other west coast cities. I visit the Pacific Northwest a bit more frequently. Earlier this year I finally managed to get to the Southwest to do photography. (I know. Those of you who have photographed there are stunned that I hadn't been there before. I understand now.) It was a revelation. Not only is the country very different from what I'm familiar with, but the place is full of very beautiful subjects, and in such quantities and diversity that I would need months or years to get to know them fully. And that trip reminded me of something I get to experience less frequently in my familiar surroundings, namely the excitement of discovering completely new terrain. So, I'm "itching" to get back to the Southwest, and I expect I'll do so later this year. I also really want to return to Alaska and spend some serious time on photography - something I was unable to do during my previous visits. Let me end, though, by looping back to the "how do you keep it fresh?" question related to photographing familiar places. Part of what keeps me going there is that the familiar places change - there is an infinite variety of conditions, light, atmosphere, and weather even in the most familiar places. I have learned that beautiful surprises are found even in the places I think I know best. :: Of all your countless outdoor photography experiences, can you give us a good story of a time that was particularly frightening or scary? I knew you would ask this, Brian! I thought about this question a lot, and I cannot come up with too many examples. I have had a few scary or dangerous experiences in the outdoors involving things like rock-climbing (at a time when I was younger and foolish in different ways than now. ), snow camping, electrical storms, falling into large cold rivers, getting caught out in storms, etc. But few of those involved photography. Generally, photography isn't quite a thrill-a-minute action sport. (Though I have been known to jump in the car and drive long distance very, uh, "quickly" to get to the right place for the right light.) However, I finally realized that I have one odd story. I do quite a bit of night photography, and one place I love to shoot and visit often is the historic Mare Island Ship Yard in the San Francisco Bay Area. I most often shoot there in the company of others, and although we don't usually work in the same spots, there is always a feeling that colleagues are working nearby. So this place that could seem a bit spooky - basically a giant, abandoned and decaying industrial site - usually seems merely quiet and peaceful. Except for one time. I met up with a small group of folks that I had not shot with before. They were anxious to get to work in the familiar core area of the place, but I wanted to first shoot a little odd subject in a less used area. So I told the to head off and that I would follow soon. I got involved in my own subject and it was perhaps a half hour before I finished that work and headed off to rejoin them in the dark. But they had disappeared. This seemed a bit odd, but I know the place, so I went to work on my own, poking into dark alleys and around behind abandoned buildings and walking quietly up lonely streets that were completely empty but for an occasional car passing by. At one point several hours later I was still doing this and still had not seen the rest of the group. As I worked up at the end of one abandoned and junk-filled dark alley, I suddenly got a very strange and uncomfortable feeling. Nothing had changed that I could discern, but I suddenly felt very, very alone and exposed and even a bit fearful. I quickly packed up, went straight back to my car, and got the heck out of there. :: What I love about your work is that it's always different, and subtle, and rarely "traditionally" iconic. Is that something you strive for? Thank you for that! In many ways, that is among the best compliments you could share. This is, in fact, something that I do strive for. When the conditions are great, I'll be right there photographing an icon with everyone else - but only when things are really special. What I really like doing is looking past the icons and trying to really see the inner quality of a place or other subject. I think that knowing a place more intimately requires me to look for smaller, more isolated elements that somehow capture or express its inner quality. While a beautiful photograph of Yosemite Falls can indeed say something about that place, I think that a photograph of a rock, the edge of a meadow, a portion of an alpine lake, or a tree has as at least as important a role in understanding or expressing the quality of such a landscape. With this in mind, to a great extent I want the photograph to somehow express the actual nature of the thing or at least my personal sense of that nature. While it can be easier sometimes to consider turning the photograph into something it isn't, especially by means of certain approaches in digital post, it seems more honest and more rewarding to me to create something that may reveal the nature of the thing itself. So, yes, I tend to (mostly) focus on trying to capture and reveal subtle things. :: What was the best piece of photographic advice someone has given you in the last five years? I'm going to push the question a bit and share two things, one of which came from much more than five years ago. Back when my father started me and my siblings in photography, he mostly avoided telling us what or how to shoot, instead offering a few useful nuggets here and there. I think he was on the right track. However, I often think of one specific thing he used to say. Although it sometimes annoyed me back then, I now take it to heart. I can still hear him saying, "Take three steps closer." That is very simple advice, but it led and leads to lots of other important considerations, including the understanding that making good photographs is often as much about what you leave out as it is about what you include. The second answer is not a piece of advice, but rather a very fortunate experience that I had. I am lucky to have known photographer Charles ("Charlie") Cramer in one way or another for many years. Believe it or not, he played at our wedding! Charlie is one of the most artistic photographers today and is also a master at printing. A few years back I was struggling with printing on inkjet printers - I knew what good inkjet prints should look like, but I couldn't get there on my own. Charlie told me to come over to his studio and bring a few files. He picked one, and we spent the next few hours working on it. Actually, Charlie worked on it, patiently explaining and demonstrating his workflow and his aesthetic choices. I learned more about producing photographic prints in this one morning with an articulate master than I have learned through all of my previous and subsequent experiences. There is much I could share about this, but I took away a little personal mantra that I always think of now when shooting or printing - "filled with light." :: What advice would you give to someone just getting started in landscape photography? Think more about photographs and less about photography gear. Gear is not unimportant, but it can be seductive in ways that can easily distract a new landscape photographer (or any photographer, for that matter) from what is really important, namely learning how to see and then how to capture that "seeing" in photographs. :: With the surge in the number of photographers entering the landscape and nature photography world, what concerns you most about where this train is headed? On balance, I think this is probably a fine thing. I suppose that one risk is in the devaluing of a lot of photography since so much decent (though perhaps not stellar) photography is now available from so many sources. We've already seen something like that in the stock photography world. I have some concerns about the fact that today many people experience photographs entirely or nearly so on small screens - and an appreciation of what a fine print can offer to those who take the time to "see" it sometimes lost. On the other hand, as the opportunities to make and share photographs increase, the end result is likely to be that more talented people will enter the field, and the best will rise to the top. In most ways, I think that this is truly a golden age of photography - a time with more potential than at just about any moment since the medium was invented. :: Of all your images, will you share three that hold particularly special meaning to you, and tell us what went into getting them? It is hard to pick just three, but I decided to pick one that is a sort of "classic," one that is very recent, and one that is not landscape. I have to warn you that there is a story behind every photograph of mine... and I love to tell the stories! I'll start with Submerged Boulders, Precipice Lake," a photograph I made back in 2008 on a weeklong trans-Sierra backpacking trip that began in on the west side of Sequoia National Park and concluded with the descent to Whitney Portal from the summit of Mount Whitney. The only other time I had traversed this route was nearly 30 years earlier, and I wanted to see what I remembered of it and to make some photographs of certain special places along the route. On that trip so many years ago we had climbed toward Kaweah Gap one morning, and near the top we suddenly came upon a beautiful alpine lake - which I immediately recognized as the subject of an Ansel Adams photograph, known as "Frozen Lake and Cliffs." On this 2008 trip, one goal was to photograph this beautiful spot, and as soon as we arrived I went to work. I'm a bit embarrassed to admit that I began by shooting from what must have been the location of Ansel's tripod, but the conditions were different, I was shooting in color, and I came away with my take on his scene. By travelling companions were becoming restless after watching me make photographs for a half hour or so , so I loaded up my pack and started up the trail. Not two switchbacks later I looked back down at the lake and realized that cloud-filtered beams of light were coming over the top of the surrounding ridges and gently illuminating the boulders submerged in the shallow end of the lake near a talus field. I recall that my first, somewhat perverse reaction was mild annoyance that I might have to unpack my load again in order to set up the tripod - but that passed, I dropped my pack right there in the middle of the trail, mounted camera to tripod, and managed a few exposures during the short period before the light on the rocks disappeared. "Green River Canyon, Evening" is a very recent photograph, made at Canyonlands National Park in early April this year during a weeklong shoot in Utah. I'm such a California-centric photographer that I had never shot in Utah before, if you can believe that! The whole trip was a revelation, and I will return there soon. I chose to not do any research on locations before going there, since I wanted to discover the place and the photographic opportunities on my own terms rather than shooting the icons. 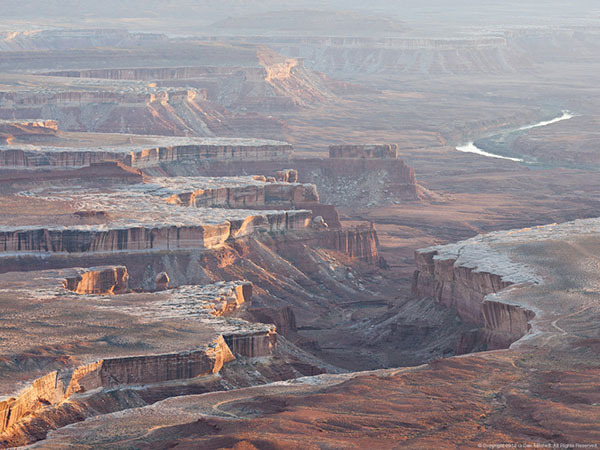 So as we drove up into the "Island in the Sky" section of Canyonlands NP, I had virtually no idea what I might find. (Funny story: at one point I saw a side road labeled "Mesa Arch," and it only dawned - awful pun! - on me later that it was that Mesa Arch!) I had read something some years ago about this terrain, and I had seen one photograph of some of the immense landscape of the Green River. I looked at a map and guessed at perhaps five or six places that might be worth scouting, and then began checking them out. One of the first places we stopped was this overlook of the Green River. Although the late-morning light was not worthy of a photograph, I thought I saw a couple of compositions that I thought might work in evening light, so I filed the spot away as a possibly location for a golden hour shoot. While visiting other locations, this spot kept coming back to mind, so I arrived back there perhaps 45 minutes before sunset, with a very clear preconception of what I would shoot and how I would compose the photographs. It was hazy, but I love hazy atmosphere, especially if it is lit from behind. I know that when the light evolves in just the right way, during the last few minutes of the day the color of the light will warm and the scene may become more visible, even in conditions that might seem very murky earlier in the day. That is exactly what happened here - the low angle sun glanced across the tops of the low hills on the mesas and delineated the upper cliffs, yet enough haze remained to mute the colors and enhance the sense of distance. I am including "Yellow Buildings, Shadows, Moving Clouds" as an example of my night photography work. 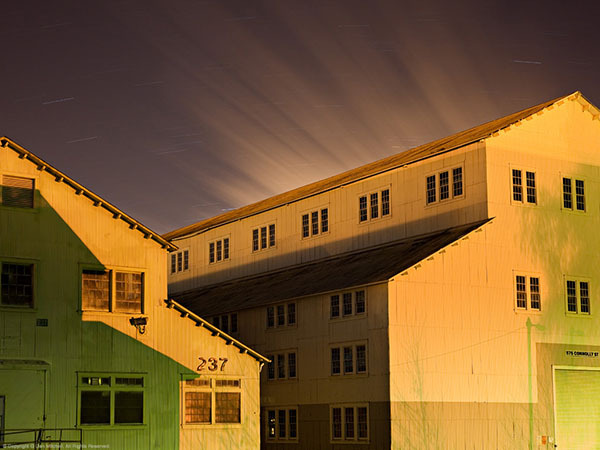 I have been photographing the historic Mare Island Naval Ship Yard at night of a half-dozen years now, often with my friends from The Nocturnes, the San Francisco Bay Area night photography group. There are many things that attract me to night photography. These include the way that night can transform a scene into something unexpected, the wild combinations of moonlight and artificial light and shadows, and the slow quite pace of the photography, since exposures can often last many minutes. In any case, on a return visit a year later these buildings were on my "to do" list once again. I was shooting something else where I noticed fog clouds drifting toward the area of the buildings, and I realized that a long exposure might blur their path as they passed overhead. I quickly headed over to this location and found a safer spot to set up on a an abandoned loading dock, and I made the exposure just as the clouds, lit by more distant urban lighting, moved past and created an effect that looks like light beams. :: Where is the most challenging location, or the place that has given you the most fits and frustrations in California, that you've photographed? Oddly, given that fact that I have shot successfully there, the coastal redwood forests really challenge me. I have visited and loved these forests since I was a child, and I have an affinity for the noble silence of the huge trees, their lush growth (the opposite of the Sierra), and the cool and moist shade. But I find them very difficult to photograph! Light is often a challenge, as it tends to vary between the midday "pizza light" (deep shadows with very bright highlights) and very dim conditions that may require exposures of several seconds. It can be hard to pick out small features and make compelling photographs of them. The vertical scale of the scenes is often daunting, especially when the dense forest often forces me to work close to my subjects. In the Sierra, along the Pacific shore, or in the deserts I usually can find a variety of ways to "see" subjects relatively quickly - but I have to work a lot harder in the redwoods. For example, it was only recently that I figured out that one way to show the vertical scale is to shoot horizontally and imply what can't fit in the frame, if that makes sense. I'm still learning. :: Do you have any projects or events you'd like to promote here? When I photograph, I'm always thinking about how the images will look as prints, and I do all of my own printing. San Francisco Bay area people who want to see my prints exhibited will be able to do so at the 10th Annual Studio Nocturne presentation at Fort Mason Center in mid-October, 2012. ... a refinement of what I do now and consistent with my current vision, but with a few twists and turns and surprises that I look forward to discovering!"